A cheer went up Thursday morning in a packed conference room overlooking City Hall when NYCHA tenants, elected officials and advocates learned that the U.S. Department of Housing and Urban Development was not going to put the nation’s oldest and largest public-housing authority into receivership, agreeing instead with the city to install a monitor over the troubled system. More details emerged about an hour later and three blocks away when HUD Secretary Ben Carson and Mayor de Blasio announced their deal. According to the agreement, the city maintains a measure of control over the system. The monitor will not oversee day-to-day operations at NYCHA, but will have sweeping powers. 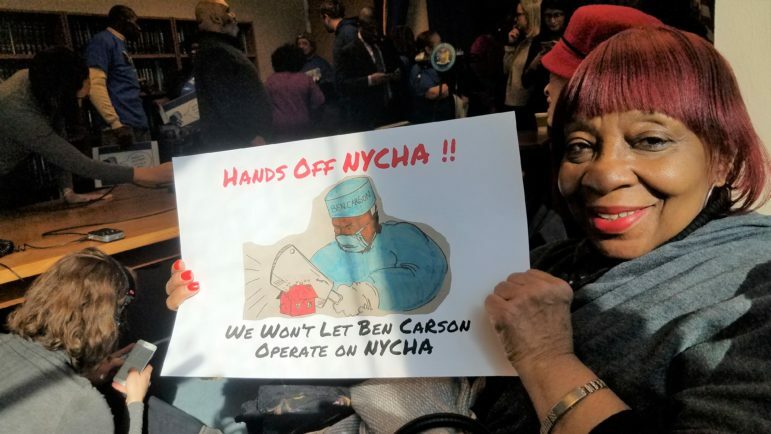 Then, the monitor and NYCHA are supposed to create a plan “setting forth changes to NYCHA’s management, organizational, and workforce structure (including work rules), and overarching policies”—language that indicates the possible abrogation of union contracts. If NYCHA and the monitor disagree on the plan, HUD and the U.S. Attorney get to decide which plan to use. Once a plan is adopted, it becomes NYCHA’s official policy. HUD and the U.S. Attorney for the Southern District of New York also gain meaningful control over the system. The city has to get both entities approval of all candidates to become the permanent chairperson and chief executive officer for NYCHA. The agreement foresees the possibility that HUD, the monitor and their chosen NYCHA CEO could exempt parts of the authority from contracts and local or state laws. The agreement overlaps in several areas with the consent decree the city signed with federal prosecutors last spring. The level of city spending required—$2.2 billion for specific actions related to lead, mold and pests over 10 years, on top of a baseline $970 million in operational funding and $2 billion in capital spending over a decade—is identical. The federal government, whose underfunding of public housing contributed mightily to the crisis at NYCHA, does not commit to any additional funding. On the key question of community engagement, Thursday’s agreement goes further than the June deal did. It requires the monitor to “engage with NYCHA stakeholders, including residents and resident groups,” convene a Community Advisory Committee (“consisting of NYCHA stakeholders such as NYCHA’s Resident Advisory Board; resident, community, and employee representatives; senior NYCHA managers”) at least four times a year to “solicit input regarding the achievement of the agreement’s purpose.” The monitor is also supposed to devise ways to solicit comments from residents and others. To a person, the officials and tenants who spoke opposed the idea of a receiver, largely because of the Trump administration’s antipathy to public housing. A monitor was seen as preferable, if not perfect. Some of Ampry-Samuels’ colleagues at the microphone did not shy from blaming the city for its role in fomenting the NYCHA emergency. “The question is, how did we get to this point?” asked Rep. Nydia Velazquez. She noted that, in addition to the federal pullback, the Giuliani and Bloomberg administrations reduced city contributions to NYCHA, too. So did the state, early in this century. Kavanagh noted that the state had recently begun making bigger commitments, although much of that money had not yet flowed to the authority. And Goldiner said it was “disgusting” that Governor Cuomo had not allocated new money for NYCHA in his fiscal 2020 budget. But Alicka Ampry-Samuel took issue with City Hall appointing a person with no housing expertise as interim head of the housing authority. If passed, the rezoning will reshape a neighborhood that is home to active heavy industry, a vibrant arts scene, major public-housing complexes and a massive Superfund clean-up. Four key housing and development posts in the administration are now in flux as the mayor navigates his sixth year in office.